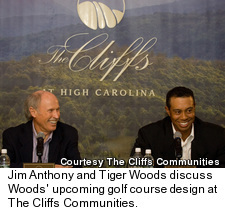 When Jim Anthony, founder and president of The Cliffs Communities, and Tiger Woods were in the process of negotiating the deal that would lead Woods to make The Cliffs home to his first U.S. golf course design, Anthony introduced Woods to his 1,000 or so associates. "He came walking out on stage and almost blew the roof off the place," said Anthony. Then Anthony helped make Woods a part of his team - by giving him a stone. Anthony gives his associates stones both a way of bonding and as a way to keep an eye on the work they do. "I gave Tiger a stone and said 'we hear your call to excellence and want to work with you,'" said Anthony, adding that the rocks are known as "Tiger's Stones" now. "A thousand people then raised their stones in unison. It really gives me chills even now." It wasn't long after that Anthony and Woods appeared together in front of the media, announcing their deal. For Anthony, it was just another example of how one of his core philosophies has helped make The Cliffs the amazing group of communities it has become. "I probably have 200 friends who work here," said Anthony, 63. "It's about loyalty that begets loyalty. We even call this a family partnership." 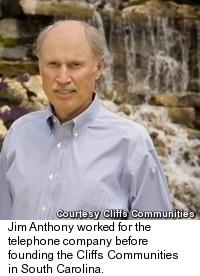 Scott Beville, president of sales and marketing at The Cliffs, echoed Anthony's thoughts, saying that The Cliffs is not about one person, but the group that Anthony has assembled and the freedom and trust he gives them. "It's really a testament to the team Jim Anthony has put together," said Beville after the deal with Woods had been announced. For The Cliffs, located in the northwest corner of South Carolina, the addition of a Woods' designed course means that members of the exclusive community have a bounty of golf riches at their fingertips. The Cliffs already counts two Jack Nicklaus Signature designs, two Tom Fazio designs and a Gary Player Signature layout among its eight golf courses. For Anthony, it's not a bad collection of golf courses for a man who doesn't even golf anymore, preferring to spend his leisure time hunting and fishing. Nonetheless, the deal with Woods has shined a spotlight not just on the amazing quality of The Cliffs, but also on Anthony himself. Growing up in South Carolina (where he still resides with his wife and two sons), Anthony went from high school to the phone company, where he worked more than 20 years as a lineman. "I was a lineman for the phone company, not a lineman for the county," jokes Anthony. It was during those years at the phone company that Anthony began his career in real estate - he bought his first property with some help from an uncle for $100, and later sold it for $600. And a career was born. "The idea was to start small so the mistakes don't bring you down, because you will make mistakes," said Anthony, who is not in charge of the day-to-day operations of the company he founded. "It was just kind of a mom and pop operation for a while." As the years went on, Anthony continued to buy more and bigger lots, and at the age of 40 decided it was time to make real estate his full-time career. Over the course of the 1980s, Anthony acquired 3,500 acres of land in South Carolina's Glassy Mountain, and in 1991 The Cliffs at Glassy debuted. In less than two decades, seven sister communities have also been built, making The Cliffs Communities one of the most impressive and honored golf course communities in the nation. When the opportunity to add Woods to his team came along, Anthony didn't hesitate, and not only because of the immense name-value Tiger brings to the table. 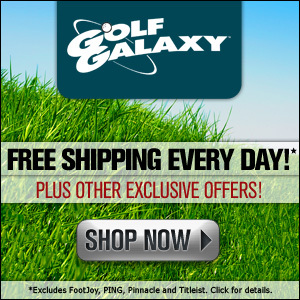 "We went after Tiger for many reasons, and one was his call to excellence," said Anthony. "And the other thing is that all our values are aligned. His work with charities over the years shows he didn't suddenly decide yesterday to give back." But while golf is why people are talking now about the Cliffs and its spectacular grouping of courses - all of which are available to members of the communities - Anthony has been focusing more on other aspects of community life, notably health and wellness. It's no coincidence that Woods' upcoming design, scheduled to break ground in 2008, is being designed as a walking course. For Anthony, health and wellness is a big part of his game plan for the future. Part of that includes international communities in Chile and British Columbia, which offer members of The Cliffs comfortable locations for vacations that include all the amenities they've grown to love. It also includes focusing on health care and quality of life. "If you meet people's needs you can be successful," said Anthony. "If you are enriching peoples lives, you are going to be successful, whether that's in real estate development or anything else." So while many would think that getting Tiger Woods on board would be the culmination for The Cliffs, all it takes is a short time with Anthony to see that he and his team are really just beginning. "We think our best ideas are ahead," he said.